Any individual in this world is said to be successful only if he/she knows how to make use of the time effectively. Also in a working environment, there is enough amount of time to use it productively and work efficiently. Sometimes, the number of working hours might be more than required than normal working hours. The real question is how to make the clock move faster at work. Getting bored at the office desk is not so cool as it creates stress of being useless or stagnated, as well as it also spoils the image of the person among the colleagues. The following mentioned are few tips on how to make time go by faster at work or ways on making time go faster. Finding the right job is the first step to look forward to the day as well as time moves faster when you do, what you love. It is not that every single person ends up with their favorite job. But, every one has an opportunity to make themselves motivated to their job role. Try establishing your presence in your team, as well try getting at least a project which you are more interested. Time moves faster when you do something which you are passionate about. Find a right job, else ask for a right job. Always try to have a clear picture of your day ahead before you start your work. Sometimes, you might be tightly packed with lots of work, and also the vice versa having nothing to do. But, planning your day ahead will give you an idea of how the day ahead looks like. Once after you schedule your work, you might know about the time period you required to finish your work as well the free hours during the day. This will eventually help you plan for you at flexible the working hours. Office desk is a place where you got to sit almost a good amount of the time in your day. And when you don’t have a busy day ahead, and you see a clumsy desk with all things misplaced you tend to lose your mood and feel stressed. Organizing is a key to move your time faster as well it’s a productive way to spend your time when you have enough free hours. So, design your desk interestingly with wall magnets, a nice flower vase, a good quote printed mug, or your best picture around. Organization you work is a place where you spend most part of your day. And more than your dear ones, any employee would always have to spend most part of the time with their colleagues throughout the day in a working environment. Create good relationships with your colleagues to have a productive work environment as well as it will make time go faster as you use your time to socialize. Socializing is a key to keep you occupied other than your regular work. It is natural to get bored when you keep working and not stagnate in one place. Try to move around your office once you accomplish a task or when you feel bored. This does not mean you got to be always around your cafeteria or around your office premises. Just make sure you take small breaks have few quick walk to make time go faster as well as makes you relaxed at work. It is scientifically proved that employees who are active on the work premises show better productivity than an employee who does not move from desk. Hence, to make your time move faster, take few steps around the desk. A good way to make time go faster is to know more about others in the team. As, sometimes when you tend to finish your work faster, you can also help others in their work or just have chat about anything be it work or even knowledge sharing about what makes you interesting. Being bored is the worst thing which anyone can end up when don’t have a good company. Help others, be one with your team to make time move faster. Most of the organizations will have many employee engagement activities going around the day. Try to be a sport, be very active and create a team to do be a part of fun engaging activities other than work. By this you can keep yourself engaged and time flies when you are very active and busy all around the day. Sometimes there are days where any employee would feel low and bored about their work. Create a task sheet, so that when you feel bored take a look at your accomplishments and compliment yourself to work better. There is nothing interesting than spending your time by seeing your own achievements. There is nothing better than getting lost in your favorite music. Take time to get lost in music when you feel bored or you could not concentrate on work. Hearing songs is like taking a mental break from the busy world around. Plug in headsets and relax to feel fresh and to get back to work. Nothing is like more occupied by hearing good music. Steal the day with lots of good music as well more energizing work. Join all fun club activities in your office to keep you more engaged. Most of the organization would always have recreational activities going around to keep employees stress free. Take part in all activities, organize more events, attend many meetings. Create an atmosphere to keep you busy all through the day. Work when you have to work and keep you occupied in free hours by being part of all fun activities. Sometimes a boring a desk or your sitting location might make you feel bored and stresses you to think about the long day ahead. If you have a chance you change your desk location or just change the direction, doing it make you feel new. By this, you may feel active and gives you the energy to meet the long day ahead. It also speeds up the day as you feel fresh and new at work. Working hard will always keep you occupied as well as be successful in work. Always make sure you do not postpone work which will stress you to not to do anything. “The more you put hard work the more you be productive” and the day moves faster the way you could not feel about how much ever long the working hours. Once, when you work harder throughout the day, you don’t have to stay after office hours. Being an expert in your job role will always make you feel good about the job. Try to learn new things, and prepare for many certifications when do not have work in your office hours. 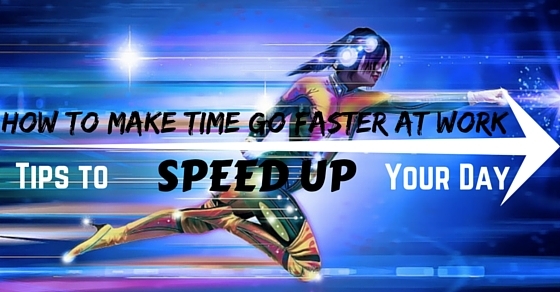 This will help you make time go faster as well helps you to be an expert in your field. Sitting all day in the same place will make you feel bored and create a feeling you work for many hours and time is still. The one easy trick is to do some interesting stretching exercises in the workplace to relax as well it will make time go faster. By this, employees feel more energized and also create a feeling of being all day occupied. Drafting emails is one of the jobs which most of the employees get to do daily as a routine. When you have a long boring day, the one interesting stuff to do is to take time to create nice legitimate emails which will keep you occupied. It not occupies but also creates a good impression about your style of drafting emails. Most of us love to drink many beverages to keep them fresh. And nothing sounds interesting other than taking a break to their favorite hot beverages like coffee in amidst of long tiring day. So, always try to take some time to have a gulp of espresso or your favorite beverage at work which will make time go faster. It is natural to feel bored and feel like running a long day at work. And it is okay to surf social media to relax and spend sometime in social media websites like Facebook, Instagram and Twitter etc. There are also professional social networks like LinkedIn which is been allowed in many organizations. Hence, when you feel its a long day, do something which interests like surfing social media etc. Playing an online game can make you feel energetic and excited. There are number of your own favorite school games which are back, so revise your childhood games and move forward and enjoy them. You may have a 9 to 5 schedule; be sure to make your place or cabin comfortable. The individual would feel better and work more when their workplace is comfortable. It is the body which should be happy in order to make your mind happy too. It is hence a good idea to possess an ergonomic chair and desk to speed up one’s work. In order to boost your mind, nothing can work well other than a cliff bar or a Choco chip. It would be perfect to fill up ones drawer with healthy snacks and keep your energy boosting up all the time. By this way sluggish work can be processed quickly and time goes faster. Fun is an important parameter which must be introduced in the workplace. In order to make time go faster, apart from the usual corporate jargon making conversation with fun can be the best way. Have a 5 minute talk with your colleague which can be something unrelated to work. Employees can pick any topic and speak in favor of it. When you’re bored or exhausted and you have a little free time, then make sure to research about your competitor. By this way individuals would be provided with leg up and they may also gain some good ideas regarding competition that is prevailing outside. Try to get lost in music for a while amidst of work and once you’ve heard a song try to get back to work schedule. This can be considered as a mental break and would help you feel better. By this way you’re boosted and work faster. It is good to spend an hour thinking about how things would have been, how work would be when there are no hindrances and ideas for new products. It is said that daydreaming is a perfect way which boosts slow day work. This is because the mind is excited and chances for things to be visualized. A simple example is that when an employee daydreams for a new position then his brain will automatically develop plans about how to get there. A hectic stressful day is not what all employees need in an office environment. It is nice to have no deadlines, no targets at work. But sometimes when you feel unoccupied that also creates stress. With the world of internet, there are so many ways to make time go faster. Always learn to keep you occupied and try to be proactive to seek out new things to do in a day. Hope this post provides some idea about how to make your day move faster.